This year’s Think Tank underway at the Atura in Blacktown. More than 100 staff attended. 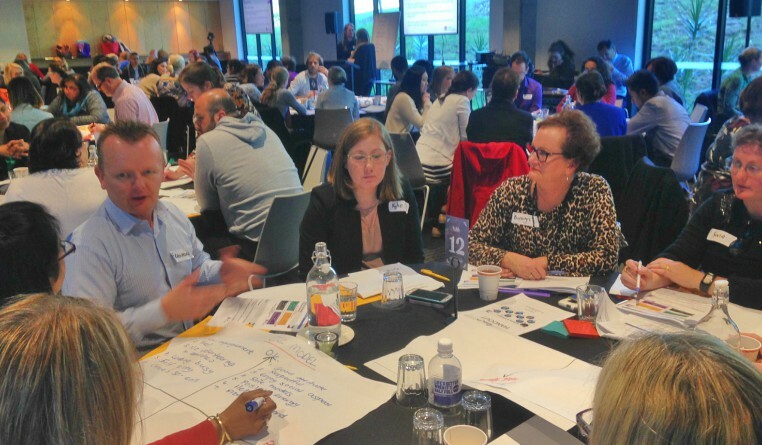 More than 100 WSLHD health professionals explored ideas at the Nursing, Midwifery and Allied Health Think Tank at the Atura in Blacktown on June 6. WSLHD Executive Director of Nursing Joanne Edwards and WSLHD Director of Allied Health Carolyn Fozzard introduced Think Tank in 2015 to build leadership capacity across the district. Staff invited to attend are “self-identified change agents” across the district in Allied Health and nursing and midwifery, who wish to build capacity and capability for change. Ms Fozzard said the event encouraged staff to consider how they could lead themselves and the system. “Today is an exciting day for our professions,” she said. Carrie Marr, chief executive of the Clinical Excellence Commission, was the guest speaker.